Nice sized bluefish in the bay. Fair fishing for flounder this week. up when anglers can get out. Further offshore saw mostly shark action. you at Oyster Bay Tackle or call 1-855-855-3906. 2013 Shark T's! In store or on Online. We also have the  2013 Shark Tank Tops. Got a few left. Get them quick. of blowfish from the Ocean City surf on Saturday. Assateague Island. They also had a small black drum." their limit of stripers from around the South Jetty. Nice size fish!" inch Flounder weighing 4.5 pounds. least 50 of them. We just followed the birds and casted. It was a blast. the southeast making it great conditions to catch blues. blowing from the southeast. He said he caught all the blues he wanted. Saturday. Another man got into shad. on Gulp. Water was 66.8 by the Route 90 bridge. Water was very clear." 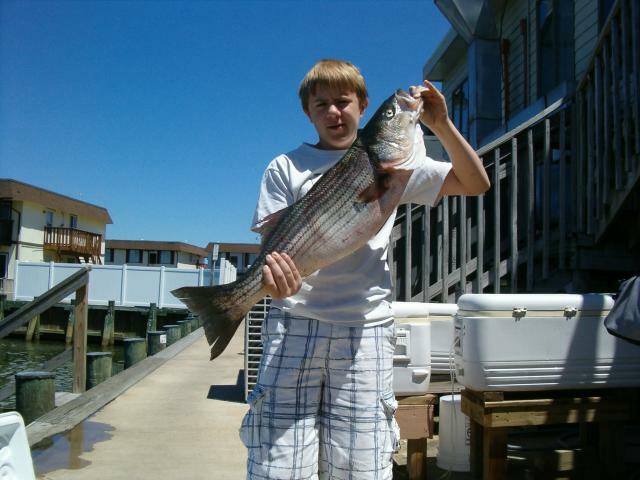 "Jeff has one of the few charters going out of North Ocean City. this week. Check out his new web site. down.. calmer..  then picking up 15 to 20 — 20 to 30 — gusting over 40..
waves. Got in on time with half-off coupons around. behind that NWesterly.. Monday was calm, a pretty day on the water. 54 degrees on the bottom, up 10 degrees from May 10th..
forecasted & sea bass bit the best they have this season..
go broke; If you don't, you'll die. only seen back-of-the-camera shots: Video & Pics came out splendidly. professional photos & video of this reef type. I can't wait." managed a 22 pound linesider with a swimming plug at the Ice Breakers. of action Sunday night. P.J. Sneeringer muscled in a 73 pound brute. pounds. Jackie Robinson reeled in a 55.5 pounder aboard the Angler. Gulp! and other soft artificials have had some nice sized weakies. Increasing numbers of spot and croakers are showing up in Delaware Bay. Kingfish have been plentiful on the Coral Beds." might work, I have seen an awful lot of nice fish caught on just Gulp. Fish and possibly Sea Bass depending on the weather. the Inlet on Monday. We have heard about a few blues on the beach too. end of your line. Massey's and the VFW slough are the hot spots. Bill's Sport Shop (302-645-7654) in Lewes, DE reports on May 30th: ""
bass, sharks. Offshore – mako..."
"05/31/13 Broke the inlet today to find much lighter winds and seas. 60 sea bass in the box and a very happy crew of regulars. 05/30/13 Few are the days I set out with trepidation about the bite. boat, "Restless Lady" had a 115 lb. mako shark caught near the Hambone. sharks and 2 duskies at the Chicken Bone."